Chronic pain is a prevalent condition that causes functional impairment and emotional suffering. To allay pain-induced suffering, opioids are often prescribed for chronic pain management. Yet, chronic pain patients on opioid therapy are at heightened risk for opioid misuse—behaviors that can lead to addiction and overdose. Relatedly, chronic pain patients are at elevated risk for suicidal ideation and suicidal behaviors. Opioid misuse and suicidality are maladaptive processes aimed at alleviating the negative emotional hyperreactivity, hedonic hyporeactivity, and emotion dysregulation experienced by chronic pain patients on opioid therapy. In this review, we explore the role of emotion dysregulation in chronic pain. We then describe why emotionally dysregulated chronic pain patients are vulnerable to opioid misuse and suicidality in response to these negative affective states. Emotion dysregulation is an important and malleable treatment target with the potential to reduce or prevent opioid misuse and suicidality among opioid-treated chronic pain patients. Approximately 100 million Americans suffer from chronic pain, a condition compounded by maladaptive cognitive and emotional processes that often cooccur with protracted and severe physical suffering . Opioid therapy continues to be the primary medical treatment for chronic pain despite associated risks, including opioid misuse, addiction, and overdose , as well as deleterious neuropsychopharmacologic effects of prolonged opioid exposure, including dysregulation in brain circuits undergirding reward processing, stress reactivity, and the proactive regulation of emotions [3, 4]. Given the magnitude of the current opioid crisis in the U.S., there is an urgent need to understand the psychological factors that drive individuals with chronic pain to misuse their prescribed opioid medications. Furthermore, the clinical presentation of opioid-treated chronic pain patients is often complicated by comorbid psychiatric distress, substance use disorders, and suicidality [5–7]—so-called “epidemics of despair” that account for rising mortality rates in the U.S. —in part through intentional opioid overdose. Yet, biobehavioral mechanistic models linking chronic pain to opioid misuse and suicidal behavior are lacking. In this conceptual review, we posit that the transdiagnostic process of emotion dysregulation is central to understanding why opioid-treated chronic pain patients engage in opioid misuse and suicidal behaviors. Although emotion dysregulation may result in multiple forms of maladaptive behavior, here we focus on opioid misuse and suicidality as sequelae of chronic pain due to their high prevalence and significant public health impact. Recent meta-analyses suggest that 25% of chronic pain patients engage in opioid-misusing behaviors like opioid dose escalation or self-medicating negative affective states with opioids . As will be discussed later, opioid misuse is associated with adverse consequences such as increased sensitivity to pain and stress, decreased sensitivity to natural rewards, functional impairments, and overdose risk [10–12]. Similarly, suicidality, which encompasses both suicidal ideation and behaviors, is especially common among individuals with chronic pain. Chronic pain patients have nearly two times the risk of death by suicide and are two to three times more likely than individuals without chronic pain to report suicidal ideation or make suicide attempts . Drug overdose is the most commonly reported means of attempting suicide among chronic pain patients . Given high rates of suicidal ideation and suicide attempts among chronic pain patients, and the ready presence of lethal means via opioid prescription, risk of death by suicide warrants particular attention among opioid-treated chronic pain patients—a population already at increased mortality risk [15, 16]. The primary aim of this review is to explore interrelationships of emotion dysregulation and opioid-treated chronic pain, and in particular, to propose how these factors give rise to opioid misuse and suicidality. To this end, we first describe emotion dysregulation among opioid-treated chronic pain patients. We then explore the role of emotion dysregulation as a transdiagnostic process underlying the development and maintenance of opioid misuse and suicidality in this high-risk population. Finally, we conclude by considering how psychological interventions designed to enhance affect regulation might address the emotion dysregulatory processes subserving opioid misuse and suicidality among chronic pain patients receiving long-term opioid treatment. The cognitive-motivational-relational theory of emotion asserts that emotions arise in response to a cognitive appraisal of the meaning or significance of a particular stimulus context . In other words, the relational meaning one derives through the process of appraisal in response to a given situation determines whether one experiences sadness, happiness, or some other emotion. From this perspective, appraisals drive emotions and thereby shape emotion regulatory attempts . With respect to chronic pain, when patients experience an aggravation in the symptomatic expression of their underlying painful condition or encounter an emotionally-distressing situation, they may respond in maladaptive ways depending on how they appraise the situation. For example, appraisals of situational helplessness, hopelessness, or feelings of interpersonal burdensomeness may drive opioid misuse as a coping strategy or thoughts of suicide as a way to escape the situation. 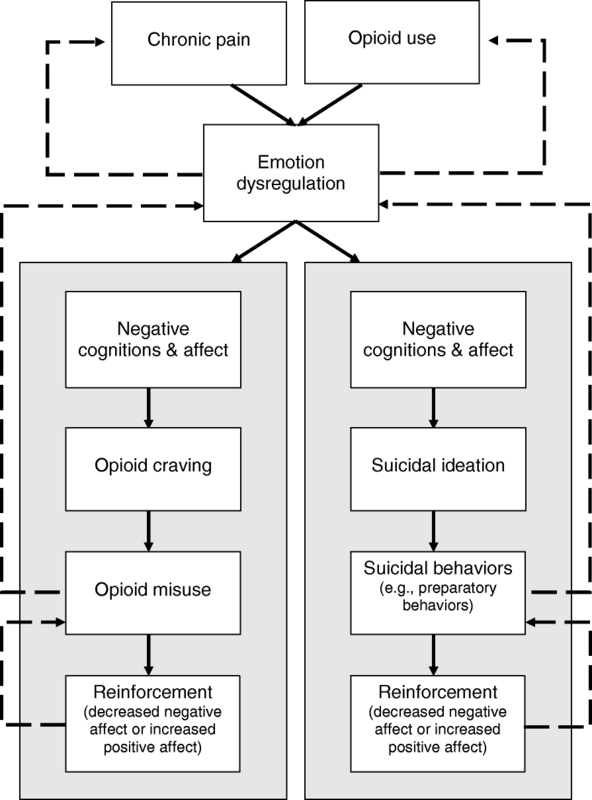 In this review, we posit that emotion dysregulation is the process that links these situational appraisals to maladaptive behaviors, including opioid misuse and suicidality (see Fig. 1 for a depiction of this process). Emotion dysregulation is marked by difficulties with the emotion-generative process and/or emotion regulation failures—i.e., not effectively employing adaptive emotion regulation strategies when it would be appropriate to do so . The decreased hedonic capacity  and heightened stress sensitization  associated with chronic pain and long-term opioid therapy indicate difficulties in the emotion-generative process. Emotion-generation difficulties may result in persistent negative affect that contributes to emotion dysregulation , and thus, these difficulties are relevant to the development and maintenance of opioid misuse and suicidality. Relying on maladaptive coping strategies to regulate negative cognitions and affect (like misuse of opioids to self-medicate dysphoric emotional states or attempting suicide to escape from emotional suffering) would be considered emotion regulation failures. Additionally, reappraisal and suppression, classic forms of emotion regulation, may go awry in response to chronic pain —a subject we will address in our discussion of factors contributing to emotion dysregulation among opioid-treated chronic pain patients. In their review of the roles of emotion and emotion regulation in psychopathology, Gross and Jazaieri (2014) outlined areas where individuals might experience emotion-related difficulties, e.g., emotion intensity and emotion duration . These difficulties with the emotion-generative process are relevant to chronic pain patients given the high levels of psychiatric comorbidities present in this population. Hyperreactivity or hyporeactivity, i.e., exhibiting too large or too small an emotional response to a given situation, are indicative of problematic emotional intensity . Among chronic pain patients, distressing situations may elicit negative emotional hyperreactivity , whereas rewarding situations may result in blunted positive emotional responses—i.e., hedonic hyporeactivity . Just as the experience of pain may modulate emotional intensity , pain may also affect the duration of emotional experience. As the experience of pain transitions from an acute to a chronic condition, negative affective reactions may become more common and long-lasting due to increasingly catastrophic appraisals of pain . In the context of recurrent negative emotionality and hedonic hyporeactivity, individuals may become hypervigilant for perturbations to their normative physiological state and negatively appraise their bodily condition as problematic. For chronic pain patients, momentary fluctuations in pain or other somatic states may be misinterpreted as dangerous or an indication of damage to the body rather than benign physiological sensations that do not signal harm . These negative interpretations can lead to a cascade of negative emotions or catastrophic thinking that interferes with individuals’ ability to regulate emotional distress. Given evidence for interoceptive deficits among individuals with chronic pain [26, 27], chronic pain patients may struggle with differentiating pain sensations from the autonomic, visceral, and musculoskeletal changes evoked by negative emotions. The tendency to label pain as “awful,” “horrible,” or with other emotionally-laden descriptors suggests pain can become conflated with the emotional distress it creates . Because interoceptive awareness facilitates emotion regulation , chronic pain patients with interoceptive deficits may be less able to discriminate pain from the physical sequelae of negative emotions, and therefore are less inclined (or able) to engage in proactive emotion regulation attempts. When chronic pain patients do attempt to regulate their emotions, ineffective strategies or skills deficits may impede their ability to experience emotional relief. For example, in response to negative appraisals, suppression may be employed in an attempt to regulate negative emotional responses. However, suppression of unwanted thoughts and emotions paradoxically leads to more intense emotional reactions as cognitive resources become exhausted . Additionally, thought suppression is associated with greater pain severity, pain interference, and depressive symptoms among chronic pain patients with trauma histories , and increased opioid craving among chronic pain patients with depressive symptoms . Rather than engaging in suppression, individuals may attempt to regulate their emotions through reappraisal, a cognitive emotion regulation strategy focused on decreasing negative affect by reinterpreting situations in more adaptive ways . However, studies suggest that both chronic pain and opioid use interfere with reappraisal processes and decrease reappraisal efficacy [33, 34]. From a neurobiological perspective, emotion regulation failures may result from inefficient top-down prefrontal modulation of bottom-up limbic activation—a pattern of neural dysfunction that has been observed among chronic pain patients . When suppression or reappraisal efforts fail, opioid-treated pain patients may turn to problematic emotion regulation strategies (i.e., opioid misuse or suicidal behavior) as means of experiencing relief from their negative cognitions and affect. Mental health professionals have traditionally relied on categorical descriptions to classify psychiatric disorders, in contrast to a newer transdiagnostic perspective that eschews discrete taxonomies to consider underlying and universal processes undergirding impaired functioning . A transdiagnostic approach may more effectively characterize the maladaptive psychological conditions that commonly cooccur with chronic pain [37, 38]. For example, chronic pain patients are at increased risk for comorbid psychiatric disorders, including depression, trauma, and substance use disorders. Indeed, it has been estimated that up to 85% of chronic pain patients experience severe depression [39, 40], between 10 and 50% report a history of trauma , and 16% exhibit substance use disorders above and beyond misuse of prescription opioids . Although these psychiatric comorbidities have been traditionally studied as separate nosological entities with distinct etiologies, emerging research suggests that they share common transdiagnostic processes that may explain their association with chronic pain. Emotion dysregulation is one such transdiagnostic process that subserves the development and maintenance of disrupted functioning and maladaptive behaviors across an array of physical and mental health conditions [42, 43]. Emotion dysregulation may be antecedent and consequent to chronic pain. For instance, individuals with a trait-like propensity towards emotion dysregulation may be at greater risk for developing chronic pain following an acute injury. However, as pain progresses from an acute to chronic condition, many individuals develop an attentional bias to pain-related information such that their attention becomes preferentially allocated to sensations of pain and environmental stimuli associated with pain episodes [44, 45]. Over time, the experience of pain coupled with this attentional bias can result in pain catastrophizing  and persistent negative cognitions, e.g., “This pain will never end” or “This is the worst pain I have ever felt.” When pain sensations are interpreted through the lens of catastrophic cognitive appraisals, chronic pain patients may experience dysregulated emotions, manifested by decreased distress tolerance  and heightened stress reactivity . In turn, the consequent deficits in positive affect and surfeits in negative affect result in heightened pain sensitivity , which thereby exacerbates and prolongs chronic pain. The escalation over time of this downward spiral of pain sensations, biased attention to pain cues, pain catastrophizing, and dysregulated emotions may drive chronic pain patients to misuse opioids  or attempt suicide as ways of responding to their overwhelming distress. For the remainder of this review, we focus on opioid misuse and suicidality—two maladaptive processes that are especially prevalent and pernicious among individuals with chronic pain. Chronic pain patients prescribed opioid therapy may turn to opioid misuse and suicidality in response to instances of emotion dysregulation, especially in the absence of other available adaptive coping strategies [9, 13]. Insofar as skill and self-efficacy are necessary for effective implementation of emotion regulation strategies , psychotherapeutic interventions that provide affect regulation training may prevent opioid misuse and suicidal behavior in the context of chronic pain. As such, we conclude with a discussion of promising behavioral treatment approaches to remediate emotion dysregulation among chronic pain patients [49, 50]. Despite increasing recognition of the public health risks of opioid analgesic pharmacotherapy , a dearth of accessible, alternative treatments has led to an over-reliance on opioids and adverse consequences for chronic pain patients . These consequences include misuse of medication (e.g., unauthorized dose escalation) as a way to escape from pain, manage mood, and relieve stress—behaviors that are maintained through a process of negative reinforcement. Chronic pain is an ever-present, aversive experience. Research supports that relief of ongoing pain increases dopamine transmission and negative reinforcement of the behavior (e.g., [50, 51]). When a chronic pain patient relieves pain with opioids, taking medication is negatively reinforced [52, 53]. Over time, some patients will begin to take their medication more frequently or in higher doses to experience less pain or greater relief for longer periods of time. Neuropharmacological studies demonstrate that opioids bind to mu-opioid receptors in brain regions subserving pain perception, emotional experience, and reward (i.e., pleasure and well-being) . Opioidergic activation of reward circuitry, including the ventral tegmental area and nucleus accumbens, results in feelings of euphoria . Consequently, chronic pain patients begin to associate opioid-related cues (e.g., the sight of a pill bottle) with that euphoria , leading to an attentional bias toward opioid cues  and the subjective experience of craving  irrespective of the need to obtain pain relief. This process of conditioning may drive opioid dose escalation and result in opioid use that increases risk of overdose . Moreover, chronic opioid use and misuse may result in allostatic changes to limbic and striatal brain circuitry leading to a persistent and escalating hedonic deficit characterized by increased sensitivity to stress and pain coupled with decreased sensitization to natural rewards [4, 59, 60]. As a result of this allostatic process, opioid-misusing chronic pain patients evince blunted autonomic responses during processing of natural rewards and while attempting to regulate negative emotions through reappraisal . Indeed, opioid-misusing chronic pain patients report less use of reappraisal than pain patients who take opioids as prescribed, and these deficits in reappraisal use predict heightened affective distress and opioid craving (Garland EL, Hanley AW, Bedford C, Zubieta JK, Howard MO, Nakamura Y, Donaldson GW, Froeliger, B. Reappraisal deficits among prescription opioid misusing chronic pain patients, submitted). This opioid-induced emotion dysregulation may exacerbate pre-existing affective disorders that antedate chronic pain and initiation of opioid analgesic use [62, 63]. Thus, individuals who are vulnerable to negative affect may be more likely to misuse medication to offset dysphoria, which may exacerbate negative mood via allostatic neuroadaptations to brain circuits involved in emotion regulation. Relatedly, through processes of positive and negative reinforcement, individuals become more likely to continue engaging in opioid misuse as an emotion regulatory (i.e., coping) mechanism; the euphorigenic neuropsychopharmacological effects of opioids may temporarily increase positive affect and decrease negative affect, propelling the cycle of escalating opioid misuse toward opioid addiction . Although the mechanisms linking suicidality to chronic pain are still being explored, consistent evidence has demonstrated that chronic pain patients are at heightened risk for experiencing suicidal thoughts and exhibiting life-threatening behaviors [13, 64, 65]. The link between chronic pain and suicidality may, in part, be explained by emotion dysregulation. For example, suicidality is often preceded by persistent negative affect and anhedonia [66–69], two characteristics that often develop in response to pain. Specifically, as individuals experience repeated instances of heightened negative affect because of pain and stress (i.e., negative emotional hyperreactivity), they may experience a concomitant blunting of hedonic capacity—the ability to experience pleasure from naturally rewarding objects and events in the social environment . This deficit in hedonic capacity may be exacerbated by the neuropsychopharmacologic effects of chronic opioid use, as articulated above. In the absence of healthy hedonic tone (i.e., hedonic hyporeactivity), chronic pain patients may respond to distressing situations with suicidal ideation, e.g., thoughts of escaping the resultant negative cognitive-affective states. In support of this, our team recently published a study on the association between suicidal ideation and prescription opioid craving and cue-reactivity . Among a sample of 115 chronic pain patients, we found that suicidal ideation predicted opioid cue-reactivity, as measured by heart rate variability while completing a dot-probe task, via self-medication urges. Just as opioid misuse is strengthened through processes of negative and positive reinforcement, chronic pain patients may experience suicidality with increasing frequency and intensity due to physical pain and emotional distress. Suicidality is negatively reinforced insofar as suicidal ideation and suicidal behaviors (e.g., preparatory behaviors) may relieve negative cognitions and affect [70, 71]—in other words, as individuals consider suicide as a way of escaping pain or hoard their opioids in preparation of attempting suicide, they may experience relief from thoughts of burdensomeness or feelings of hopelessness now that they have determined a way to end their suffering. These suicidal thoughts and behaviors may produce positive affect, such as feelings of calm or acceptance of death. The dangerous escalation and cooccurrence of opioid misuse and suicidality may result in death by overdose or suicide if left untreated. A growing body of literature has illustrated the effectiveness of psychosocial interventions to address chronic pain. For example, a recent systematic review of randomized controlled trials (RCTs) of mindfulness-based interventions (MBIs) for chronic pain demonstrated significant improvements in pain, depression symptoms, and quality of life . Similarly, cognitive-behavior therapy (CBT) has been extensively researched as a treatment for chronic pain, and has demonstrated efficacy for reducing pain-related interference by restructuring the cognitive distortions that arise in response to pain, as well as by increasing activity scheduling and pacing . Though both MBIs and CBT can reduce negative emotional hyperreactivity [50, 72], neither MBIs nor CBT are specifically focused on remediating hedonic hyporeactivity undergirding opioid misuse and suicidality among chronic pain patients—a key risk mechanism thought to perpetuate the downward spiral of behavioral escalation articulated above. In contrast, Mindfulness-Oriented Recovery Enhancement (MORE) is a novel intervention that combines principles of mindfulness, CBT, and positive psychology to target hedonic dysregulation in addiction, affective disorders, and chronic pain through training in mindfulness, reappraisal, and savoring skills [73, 74]. Completed and ongoing RCTs are demonstrating positive effects of this intervention on treating pain symptoms and opioid misuse among chronic pain patients prescribed opioid therapy . From a mechanistic perspective, the three primary components of MORE may be especially efficacious means of remediating the emotion dysregulation that impels both opioid misuse and suicidality among chronic pain patients. Mindfulness can be conceptualized as a practice, a state, and a trait . The state of mindfulness is characterized by a nonreactive, metacognitive awareness and acceptance of present moment thoughts, emotions, and sensations . Mindfulness practices include mindful breathing, body scan meditations, and the informal practice of mindfulness during everyday tasks and activities. As one evokes the state of mindfulness through these practices, one begins to develop the trait of mindfulness, or dispositional mindfulness . With respect to the focus of this article, trait mindfulness is positively associated with psychological well-being  and negatively associated with self-medication of negative emotions with opioids among a sample of chronic pain patients . Mindfulness practice appears to strengthen the function and structure of prefrontally-mediated cognitive control networks [80–83], including those associated with emotion regulation, which in turn promotes top-down regulation of bottom-up emotional impulses [83, 84]. Moreover, mindfulness alleviates pain by facilitating a shift from affective to sensory processing of pain sensations [75, 85] and reducing thalamic amplification of nociceptive input via prefrontal cognitive control mechanisms [86, 87]. In these ways, mindfulness training can promote emotion regulation, reduce pain, and prevent maladaptive coping behaviors. Reappraisal is an adaptive emotion regulation skill that can interrupt intense or persistent negative emotions . Recent neuroscientific research demonstrates that it may also activate brain reward circuitry in ways consistent with positive emotion regulation . Specifically, as individuals examine irrational or unhelpful cognitions that arise in response to distressing situations and recognize how those perceptions influence their emotional experiences, they can dispute those negative cognitions through the process of reappraisal and thereby experience consequent decreases in negative affect and increases in positive affect. Further, cognitive regulation strategies like reappraisal have been shown to be an especially potent means of decreasing pain intensity, in part though cortical modulation of pain and concomitant emotional reactivity [90, 91]. According to recent theorizing, reappraisal may also be strengthened by mindfulness practice —a claim supported by empirical evidence [93, 94]. MORE capitalizes on the synergy of mindfulness and reappraisal to strengthen emotion regulation capacity. The final component of MORE, savoring, targets hedonic hyporeactivity resulting from chronic pain and long-term exposure to opioids . Savoring is an emotion regulation strategy in which the individual mindfully attends to features (e.g., the sight, sound, scent, and feel) of naturally-rewarding stimuli (e.g., beauty of the natural world, affiliative rewards, pleasurable physical sensations) while metacognitively monitoring and appreciating pleasant emotions and higher-order affective meaning arising from the encounter with the pleasant stimulus. According to the restructuring reward hypothesis , savoring may counter hedonic hyporeactivity underlying opioid misuse by shifting valuation of drug-related rewards back to valuation of natural rewards. A number of studies have provided support for the restructuring reward hypothesis by demonstrating effects of MORE on autonomic [95, 96], electrocortical , and neural functional  measures of reward processing that were in turn correlated with reductions in drug craving and use/misuse. Moreover, increasing positive affect has analgesic effects , and in that regard, increasing brain reward responses through mindfulness and other behavioral manipulations has been associated with decreased pain [100, 101]. MORE shares common transtherapeutic processes with other MBIs and CBT approaches; however, the unique integration of its three components may be especially effective for addressing emotion dysregulation among chronic pain patients. To be clear, whether or not they are combined in an integrative treatment package like MORE, therapeutic techniques involving mindfulness, reappraisal, and savoring can successfully treat the difficulties in emotion-generation and emotion regulation failures associated with maladaptive pain coping. Moreover, new affect regulation interventions and those that have demonstrated success in reducing suicidal ideation and substance misuse outside the context of chronic pain might be translated and tailored to address the unique clinical features of comorbid pain, suicidality, and opioid misuse. Cognitive, affective, and physiological antecedents and consequences of pain render chronic pain patients prescribed long-term opioid pharmacotherapy vulnerable to opioid misuse and suicidality—two hazardous behaviors with significant mortality risk. Established bidirectional relationships between pain, opioid use, and affective distress underscore the potential role of emotion dysregulation in the development and maintenance of opioid misuse and suicidality among chronic pain patients. As such, emotion dysregulation represents an important transdiagnostic treatment target for future prevention and intervention approaches designed to reduce lethal and life-threatening behaviors among opioid-treated chronic pain patients. ELG was supported by grants NIDA-R01DA042033 and NCCIH-R61AT009296 during the preparation of this manuscript. MRR developed the conceptual framework and conducted the literature review. MRR, SEP, MOH, and ELG drafted the manuscript. All authors read and approved the final manuscript.